How do you and milk get along? Are you lactose intolerant? Do you get bloated, gassy and tummy aches whenever you’ve had too much dairy products? You’re not alone. It seems that I meet more and more people who claim they cannot digest milk. I’m one. I am lactose intolerant. However, I love dairy products too much to give it up. I have never been a big milk drinker, but I do love ice cream, cheese and creamy desserts. So I suffer the consequences during the times that I indulge. My case is mild though and it’s quite tolerable. So I haven’t totally scratched dairy from my diet; I just try to not indulge too often. I don’t know how it is for the ones who are really sensitive though. I do know that a lot of people are turning to lactose free products or dairy alternatives just to avoid the symptoms from cow’s milk. 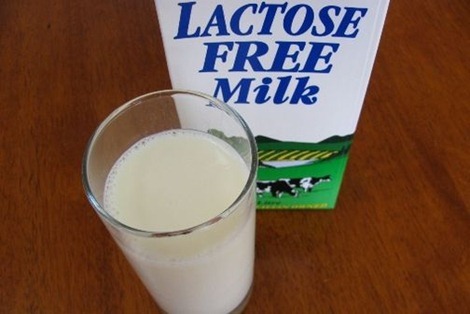 But… Did you know that lactose free milk also comes from cows? There are now quite a few milk producers out there who sell ultra pasteurized cow’s milk that is lactose free and still contains all the nutritional benefits. Deion Branch of the New England Patriots found out first hand as part of the Fuel Up to Play 60 initiative when he visited a dairy farm. Click on that first link above to see a funny video of him milking a cow! The Fuel Up To Play 60 initiative aims to get young people eating healthy and exercising. A great deal of eating healthy though, involves including dairy in your diet. The recommendation is to get at least three servings of dairy per day. However, that doesn’t mean only drinking milk. You can get your daily nutrient requirements in different ways such as cheese, yogurt, or even flavored milks like chocolate milk is usually tolerated better by people with lactose intolerance. The point is, being lactose intolerant does not mean totally eliminating dairy from your diet. You can still take advantage of the high nutritional value of dairy even if you may suffer some symptoms from it by regulating the amount of lactose you consume and trying out other forms of dairy products. Disclosure: This post is sponsored but all opinions are my own. My husband and I are but we’re not eliminating milk either. Just taken moderately on cereal and for dipping cookies, haha. I’ll check that product you posted. Thanks.